“An empire founded by war is to maintain itself by war”. Superficially, the alien collective known as the Covenant came to an end in late 2552, after the High Prophets approved the Jiralhanae’s replacement and extermination of the Sangheili. 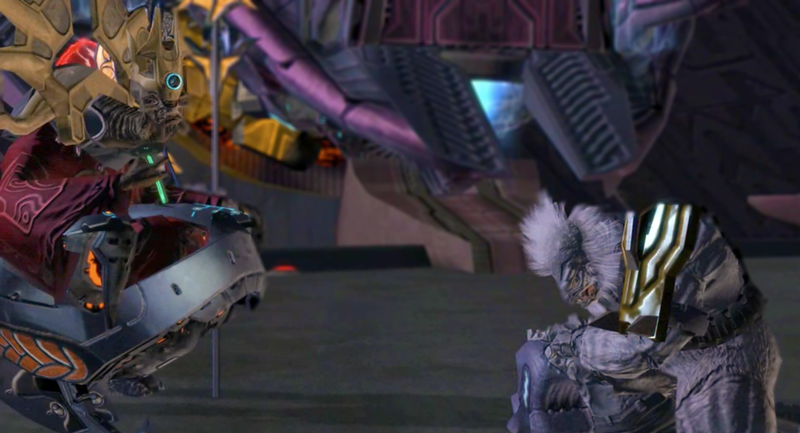 By March 2553, the Sangheili under command of the Arbiter made official a tentative truce with humanity; it was this alliance that had stopped the Prophet of Truth and the last of his loyal forces from destroying the galaxy’s sentient life at the Ark. That the final spark that caused the sundering of the Covenant was the Great Schism, however, is largely immaterial. From its inception, the Covenant was a broken alliance that was doomed to destruction from within. While the war with humanity hastened its collapse, the signs of its failure were apparent long before, and each race would find its dissolution heralded catastrophic changes for their people. The Covenant’s origins lie in a protracted war between a group of San ‘Shyuum Reformists and the Sangheili. The conflict was sparked by a key disagreement between the two species over the handling of Forerunner relics, sacred to both cultures. The Sangheili considered tampering with the artifacts of their gods verboten; the Reformists had left behind the rest of their race, who had believed much as the Sangheili did, and were on a quest to derive new technologies from the relics. The war turned into a bloody stalemate that neither side could not afford to wage. The Sangheili, outmatched by the powerful Forerunner Dreadnought the San ‘Shyuum fielded, were forced to violate their tenets and attempt to engineer defenses from their own Forerunner relics. The San ‘Shyuum, already few in number, realized that annihilation of their entire group would be all too easy, especially if another race such as the Sangheili still stalked the void of space. And yet as soon as the Covenant was spawned in 852 BC–the same time Homer was composing paens to the classical world’s wine-dark sea–the foundations were on shaky footing. The truce required no side to admit the error of their position, which meant that the issue of proper handling of Forerunner relics was merely sidelined by convenience, never solved. The San ‘Shyuum saw their new protectors as simple, more concerned with bloodletting and honor than the practical. The Sangheili, meanwhile, viewed their new scientists and stewards as slippery and guileful. Furthermore, the lack of integration between the two societies meant that there were no other cultural ties to strengthen the alliance. There was a reason that European royal families of yore backed up peace treaties by offering daughters and sons in marriage–strengthening family ties between competing factions was one way of helping defuse tensions. But aside from the biological impracticalities of intermarriage in the San ‘Shyuum and Sangheili’s case, the lack of any effort in adapting each others’ cultures meant that no real assimilation between them ever occurred. Once the San ‘Shyuum decommissioned their Dreadnought’s weapons and used it to power the mobile capital city of High Charity, they lost all their positions of strength–their superior firepower and mobility. From then on, they were at the mercy of the Sangheili, whether each side realized it or not. Perhaps this imbalance was one of the reasons that the Covenant offered its promise of salvation to other races. The first to be incorporated were the Lekgolo, whom the Covenant discovered eating their way through Forerunner metals. Then came the insectoid Yanme’e, the plundering Kig-Yar, then the crab-like Unggoy. This offer was not exactly made graciously, usually only coming after a near-catastrophic war for the new client race. A key shared pattern in this forced conscription was that each race, like the Sangheili and San ‘Shyuum, retained a large degree of autonomy. The Kig-Yar, an ancient race with deep ties to piracy, accepted letters of marque–becoming privateers like those of Earth’s 18th century seas. They continued to carry out their marauding ways, this time under the banner of the Covenant. The Yanme’e remained almost entirely separate from the rest of the Covenant, only interacting in issues of trade and combat. Likewise, the Unggoy’s natural tendency to breed uncontrollably constantly led to population pressures, but they retained games and customs from their homeworld. As a result Covenant member races were cohered by only two factors–a carrot and a stick. The carrot was the Great Journey. While the promise of salvation for all who follow is an effective tool, it is a transcendent common goal, not a practical one. The validity of the religion was conflictingly accepted as well; many of the Sangheili who followed the Covenant did so out of convenience and technological considerations, and some resisted many years after the Covenant was founded.2 Some San ‘Shyuum believed in the Forerunner’s divinity due to the absence of evidence to the contrary, rather than any deeply-held conviction. The stick, meanwhile, was total destruction. A civilization that has the power to obliterate one’s entire planet is a psychological weapon as well as a physical one. “Directly preceding their assault on the colony world of Biko, the Covenant transmitted a message to its surface. Within this message was a bold claim: ‘your world will burn until its surface is but glass’ – a claim that clearly indicates the Covenant leadership believes they possess the power to literally reduce a planet’s surface to a molten state. Assuming they have the wherewithal to back-up such a claim, the dangers to our creators are obvious. Any rebellion by any member race would threaten not just their lives, but their entire species. Individuals can be motivated to sacrifice much, including their own lives, but that incentive usually stops with the threatening of one’s friends, families, relatives and the obliteration of the sum of their race–art, language, culture, geography. In human history, mere threat of force is often not enough to stem rebellion–it requires an active destruction of anything that can spark the desire to rebel. And this is where the Covenant’s sectionalism created the fractures that would destroy itself. By not fostering a common culture, each race was left with its own value system and culture that would breed dissension. The San ‘Shyuum considered allowing the Sangheili and other cultures to preserve their traditions as necessary5–but this policy was destined to doom it. A key aspect of the Covenant’s power system was that Forerunner relics would be shared. The San ‘Shyuum, by virtue of their technical prowess (aided by the Huragok, though few of the Covenant’s number suspected this) distributed the relics and the technology derived from it. This created a dangerous balance of power that was in constant threat of being tipped; the San ‘Shyuum worried what would happen if one of the other races captured a Forerunner reliquary for themselves, and rightly so;5 any race that could wrest some of the ‘Shyuum’s power would weaken all the links of the Covenant, especially if that race had little political capital otherwise. The competing egos and cultures of the Covenant would slowly come to a head with the induction of the Jiralhanae or “Brutes” in 2492. The Jiralhanae’s headstrong and brutal nature clashed with taking orders, especially from the equally proud Sangheili. The incompatibilities between the two races seemed to have been defused partly by segregating Jiralhanae and Sangheili units. Yet the Jiralhanae’s rapid and zealous conversion to the Covenant faith, combined with their formidable combat abilities, quickly made them favored by the San ‘Shyuum. Here was a race that upset the balance of power by giving the San ‘Shyuum their own martial outlet. For the High Prophets, especially Truth, the Brutes represented a far more obedient and predictable soldier, while the Sangheili’s ancient customs of honor threatened to weaken the Covenant–some among their ranks openly questioned why the Hierarchs had not inducted humanity into the Covenant like all races before.6 The rest of the Covenant (and likely many San ‘Shyuum) did not realize that the reason for humanity’s destruction was the revelation by the Forerunner AI Mendicant Bias that humanity was descended from the Forerunner, thus conflicting with the message of transcendence the Covenant offered. The San ‘Shyuum who became the Hierarchs Truth, Regret, and Mercy recognized that with the dissolution of the religious aspect, the Covenant would fall apart. The San ‘Shyuum would have no moral or spiritual power, leaving them at the mercy of the military. It is unlikely that even without this revelation, contact with humanity would have been anything short of disastrous for the Covenant. Much like the martial nature of the Brutes upset the Sangheili’s dynamic within the Covenant, the humans’ innovative technological style would have been a grave threat to the power wielded by the San ‘Shyuum, who could have in time been bested by human scientists at deciphering the Forerunner’s mysteries–less than thirty years after first contact, the UNSC had already developed more efficient shield technology than that of the Covenant’s frontline troops. Ultimately, the Covenant broke apart in the space of weeks. The initial damage was severe; the Flood’s infestation of High Charity consigned millions to death or absorption into a very different kind of collective. Untold others were killed by the Sangheili/Jiralhanae-led infighting that followed. Much if not most of the Loyalists were killed in the failed expedition through the Ark Portal, while the Sangheili lost a huge portion of their fleet with the razing of the planet Joyous Exultation by Whitcomb’s NOVA bomb, and the failed campaign above Onyx. As grisly as this early carnage was, however, the long-term effects of the Covenant’s destruction spelled greater calamity for all races involved. The coalition ingrained an extreme state of interdependency between the client races, and resulted in a massive concentration of technical and scientific expertise in the hands of the San ‘Shyuum and the Huragok. Most or all of the San ‘Shyuum were killed in the purges following the Great Schism or lost when the Flood consumed High Charity, and the many of the Huragok have fled to parts unknown, meaning that the designers and caretakers of Covenant technology are largely gone.7 The massive Assemblies and Forges on High Charity are likewise destroyed and lost, meaning that whatever methods of automated fabrication the Covenant had, its ability to repair or create is greatly lessened. The Elites, who disparaged healers and engineers, now find themselves without the means to repair their ships. Due to the cloistered secrecy of reverse-engineered Covenant technology and the fact that much of the technology is imprecisely adapted from Forerunner designs, the member races of the Covenant have even less chance of learning their function. Those best suited to deal with this post-Covenant world are the Kig-Yar and Jiralhanae, as both retained more of their pre-integration technology. The Jiralhanae’s inferior arms and (presumed) corresponding simplistic designs would make refit and repair more manageable, assuming that the Jiralhanae did not beat each other to death with them first. The Kig-Yar, meanwhile, might be the only species capable of thriving, as they have long shown the ability to trade and cooperate with humanity, while they can prey like scavengers on the other races. The “lost” human colony of Venezia was likely one of the early melting pots for human-Kig-Yar relations. If they were to leverage their access to inter-species black markets, supplying other Covenant groups with human weapons and supplies it would massively bolster their potential success on the field (as well as providing players with more interesting scenarios of engagement in future games). The Unngoy, meanwhile, as the only methane breathers and without command of their own ships, face a far darker fate–suffocation, if existing methane apparatus fail, or simple death, if the races whose ships they are aboard tire of them. Ironically the best path forward for the ex-Covenant species would be a return to cooperation and trade with each other, much like the Storm Covenant of Halo 4. While not a return to the full glory of the Covenant, the matériel Jul ‘Mdama’s forces muster barely four years after his mission to find the Didact is still impressive. Little is known about how the Storm functions outside its familiar combat organization, or whether ‘Mdama’s assumed piety trickles down to the regular troops. While the Storm managed to muster enough force to pose a significant threat to the UNSC at Requiem, the influence that their relatively small military poses to humanity as a whole is, for the time being, negligible. Without the support of all Sangheili and the Covenant’s previous client races, combined with the disappearance of the Huragok, the Storm is inevitably going to be left at status quo unless some new power rises again to bolster their ranks. While Jul M’dama is working hard to retain what little he can of the previous Covenant’s might, this Covenant remnant is in a poor state without the Didact around to reinforce their campaign. With the dissolution of the previous Covenant empire so recent, many Sangheili are likely hesitant to fully commit to another religious leader claiming to follow the will of the gods. Direct communication with the Didact or not, the Sangheili now understand that their deities are mortal, and prolonged exposure to the Didact, his Prometheans, Requiem, and–more importantly–M’dama’s feigned zealousness is only likely to reinforce that fact, leaving the leader of the Storm with little to back up his religious campaign. Much as the Covenant was inevitable undone by the long seated mistrust and discomfort each client race had with the other, so too might the Storm fall from within, given time. The only long-term option for the Storm and other ex-Covenant might be a return to the Covenant’s roots, not just seeking to gain power from the reclamation of Forerunner relics, but from the absorbed species upon which their union relies. While separately the various member races are weak, the Grunts, Drones, Jackals, and Lekgolo, in theory, still have resources on their home planets to draw from. With conventional Forerunner-derived technologies no longer accessible, adding more might to the Storm might mean relying on less conventional technologies and operations. The Lekgolo, most importantly, were known to form Mgalekgolo (Hunter) combat bonds even before the Covenant existed and fitted them with their characteristic framework armor. Before then, were bonded pairs without form, a mass of unorganized Lekgolo worms, or did they have their own form of technology? We know that the Lekgolo could digest Forerunner metals, suggesting that they could shape or even excrete durable materials. While the Covenant treated them as little more than raw materials for controlling larger constructs, they could indeed have far more to offer. If the Storm or another faction had access to the population of Te along with this theoretical technology, they might have enough production capacity to bolster their fleets and armies with new machines. In fact, it may be possible that we’ve already seen this substance and technology put to use. The Storm themselves are just a small portion of the many left in the Covenant’s wake. Perhaps others are following M’dama’s lead and forming new collectives of their own. Perhaps the time of the Sangheili’s dominance within the Covenant races is at an end; perhaps the majority of the Sangheili will become more insular, especially if the civil war still rages on their home planet. If human history is any indication, however, from the ashes of the last empire are often borne the seeds of the future one. Whether or not the Covenant will truly rise again–and whether humanity can prevent it from happening–remains to be seen. 2. Frankie, HBO Forums; Halo Legends, “The Duel”. 3. The Assembly, Data Pad 10; Halo: Reach. 6. “Conversations from the Universe”. Finally! A new article! I knew there was I reason I kept checking this site. Also, does it count as first if the only other person who posted is one of the people who run the site? Yes, I suppose is does. We’re running lighter on content due to our Community Evolved book project, but rest assured we’ll be back to a more frequent schedule later in the year. Oooh, also, have you guys heard of Destiny? Would love to see this explored in the official fiction, but I’m not going to hold my breath.